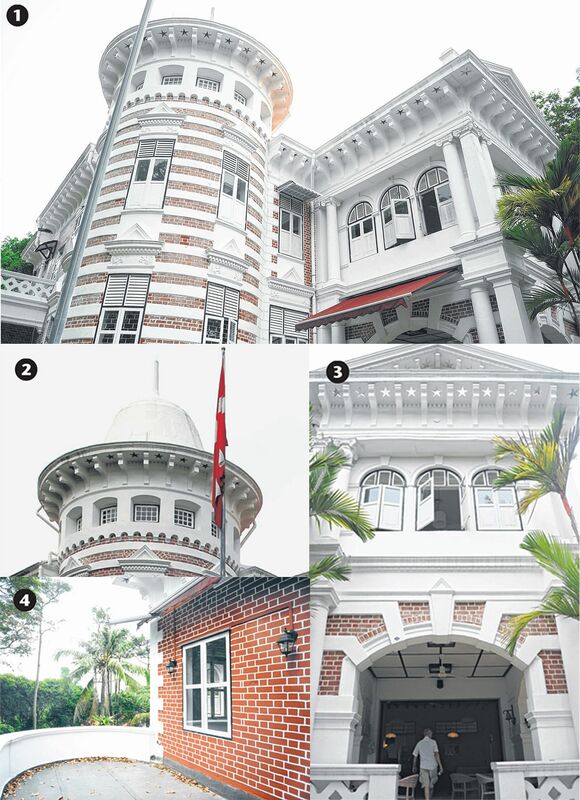 If you go up Mount Faber via Pender Road, you will see a striking two-storey mansion with red and white stripes and the sign "Danish Seamen's Church". Although it still serves the Danish community, the building is called Golden Bell Mansion. It was completed in 1910 by businessman- philanthropist Tan Boo Liat, great-grandson of Tan Tock Seng, as a private residence. Mixing colonial and Asian styles and now gazetted, the house was opulent for its time. It had four bedrooms, a billiard room and a smoking room. Servants' quarters were built at the back of the house. It was named after Mr Tan Boo Liat's grandfather Tan Kim Ching, whose name means golden bell. Famous people have visited the house. Chinese revolutionary leader Sun Yat Sen, whom Mr Tan Boo Liat was a strong supporter of, once stayed there in 1911. The house was sold after Mr Tan died in Shanghai in 1934. It has been used by the Danish Seamen's Church since 1985 and was given conservation status two decades later as part of the Southern Ridges conservation area. While much has been written about the original owner and his family, British anthropologist and author Julian Davison is more intrigued by the house's architect. Dr Davison, 59, calls Mr Moh Wee Teck an enigma, despite him being the "shophouse king", having designed and built hundreds of them in areas such as Duxton and Emerald Hill. Other than Mr Moh's sign-off on architectural plans, information about his life is scant. Dr Davison says: "There are at least 100 buildings still standing in Singapore by this one architect, thanks to the conservation laws. But he's a mystery. From plans that still exist, we know he appeared around 1890 and disappeared around 1912." He says the house is a "one-off piece", not typical of Mr Moh's other works, which adopted a more baroque or classical style. The style of repeated layered red- and-white bricks is known in architecture as the blood and bandages style. For the squeamish, British anthropologist Julian Davison likens the bare red brick and white plaster to "streaky bacon" instead. The look was popular in the late Victorian and Edwardian eras in Britain. Another English detail was the encaustic tiles, which are patterned ceramic tiles inlaid with different- coloured clay. The technique - clay was put in geometric moulds and fired without glazing - dates back to mediaeval Europe. The house was a mix of different architecture styles, including influences from Thailand. A stupa, which tops the circular tower column of the mansion, is the most striking homage to Buddhist architecture. The dome was traditionally built to store cremated remains or possessions of important figures. The tower column houses the spiral staircase which leads to the second floor. The addition of the stupa is a possible link of Mr Tan Boo Liat's ties to Thailand where he often did business. Entrances have voussoirs, or sunburst-like wedges stemming from its arched frames. This adds a "dramatic" effect to the entrances, says Dr Davison, who wrote a 2010 book, Singapore Shophouse. Other quirky features include star-shaped ventilation holes. They are on the underside of the eaves that run the border of the house. Dr Davison has not seen a unique detail like this in other houses here and is unsure why the architect chose this symbol. To take advantage of the garden space and sea breeze, there are verandahs or small balconies on the first floor, where the family could gather on cool days or host parties. The house has a more Western- style layout with the communal spaces on the first floor and bedrooms with balconies on the second floor. Dr Davison surmises that the mansion could have been a house where Mr Tan entertained guests and he lived in another house elsewhere.